The Alas are a people group located in Southeast Aceh Regency, Aceh Province. There are many rivers in the Alas area, including Lawe Alas (Alas River). The area where they live is known as "The Land of Alas". The word alas refers to a mat used for sitting or sleeping. The origins of the Alas remain unknown, although they share many similarities with the Batak ethnic group, such as their language and their family names. Among their folk tales are stories about some Batak idol worshippers from Lake Toba who came to the mountains under their leader, Alas. 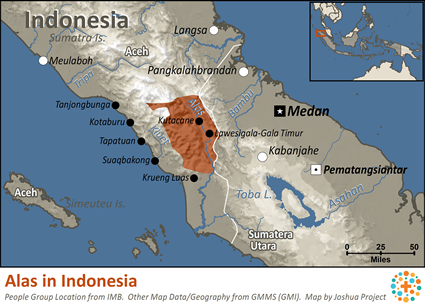 The long-held traditions and culture of this ethnic group have often been identified with those of the Gayo. During the Dutch colonial era, the government treated these two areas as one district (Land of Gayo and Alas). However, the Alas people are a unique people group with their own culture and language which is actually quite different from the Gayo culture and language. Since 1974, the Alas and Gayo areas have been included in the Southeast Aceh Regency. The Alas are a majority in the districts of Badar, Babussalam, Bambel, Lawe Sigala-gala and Lawe Alas. The standard Alas dialect is the Babussalam dialect. It is also divided into the river-based dialects of upstream or Hulu, central or Tengah and downstream or Hilir. Most of the Alas people live in villages at high altitudes and make a living from farming and raising livestock. The Alas area is considered the "rice storehouse" of the Aceh area. Other agricultural products include rubber, coffee and kemiri (a local spice) as well as forest products such as wood, rattan, resin and incense. Several areas have been disturbed by landslides, erosion and flooding caused by of deforestation. An Alas village is called a kute. A kute usually consists of one or more clans called a marga. Extended families live together in one house and submit to the authority of the parents. They are a patrilineal society, tracing descent through the father's family. The Alas culture emphasizes two kinds of laws. They have both religious laws that are given by God and cannot be changed and traditional laws that are made by community leaders and can be changed according to the times. According to marriage customs, an engagement lasts from one to three years as the groom acquires the bride price and the bride acquires the groom price. When they marry, they live near the groom's parents. After they have children, the young family moves and lives separately (jawe), but they remain in the area of their own clan. Polygamous marriages are permitted only when the marriage has produced only boys, only girls, or no children at all (adak meu keu dueu). The Alas people are followers of Islam. Syari'ah Islamic law has been implemented in this area. Even so, many Alas still believe in supernatural powers, occultism, magic and shamans. They perform ceremonies so that their crops will prosper and be protected from plagues. The shaman reads mantras and uses magical potions of leaves and flowers that are considered powerful for warding off plagues. The Alas greatly need education and economic development. Southeast Aceh has great potential for tourism, agriculture and mining, but it has not yet been tapped. Foreign and national financial investment to develop this potential would greatly help the progress and well being of the local people. This area has been affected by floods mixed with mud, sand and gravel. They need resources to handle the threat of erosion, flooding and landslides. This would include education in forest management and reforestation, as well as development of flood prevention methods. View Alas in all countries. Location in Country: Two areas, Aceh Province; 1: inland from Tapaktuan, and 2: northwest towards Kutacane; eventually into Sumatera Utara Province.